When it comes to tile and grout, there are a variety of cleaning misconceptions that may prevent you from getting the job done correctly. From using regular dish soap to scrubbing aggressively, certain cleaning methods may actually damage your tile and grout. Mr. K's Carpet Service, serving Albany, Orange, and Rockland counties in New York, wants to help you separate fact from fiction. Here are some of the most common myths about tile and grout cleaning. Although they may indeed remove those stubborn stains on your tile and grout, acids and bleaches will also strip your flooring materials. These highly corrosive chemicals degrade and deteriorate tile and grout, causing cracks and breakages. For particularly tough stains, hire the professionals to use high-grade cleaners and safe methods. Many people believe that scrubbing tile and grout with wire brushes is an effective way to combat dirt and debris. However, wire brushes can be too harsh for tile and grout, resulting in scratched and blemished surfaces. Use gentle brushes with nylon fibers to clean your tile and grout, and try not to scrub too vigorously. 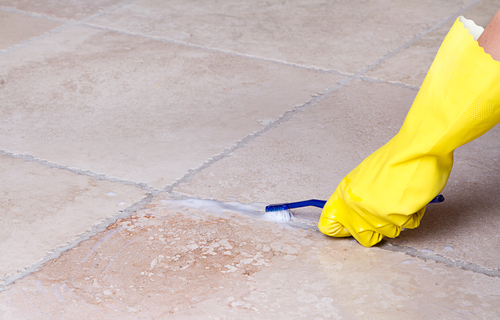 While regular mopping will keep your tiles clean, your grout requires more detailed attention. When you mop your floors, dirty water tends to settle into your grout and cause deep staining. In addition to routine mopping, remember to clean your grout separately, using gentle brushes and detergents. Mop and scrub as you normally would, and enlist the help of a professional tile and grout cleaning service once or twice per year. When you want your floors to sparkle and shine, rely on Mr. K's Carpet Service for your tile and grout cleaning needs. Give them a call at (845) 294-5345 today to book an appointment for residential or commercial cleaning. For more information about carpet cleaning and other services, visit them on Facebook.